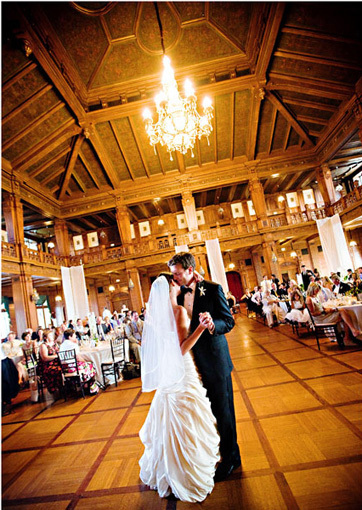 The Ballroom is 99 feet square and 45 feet high. It has a mezzanine or balcony 16-1/2 feet wide on all four sides of the second story. 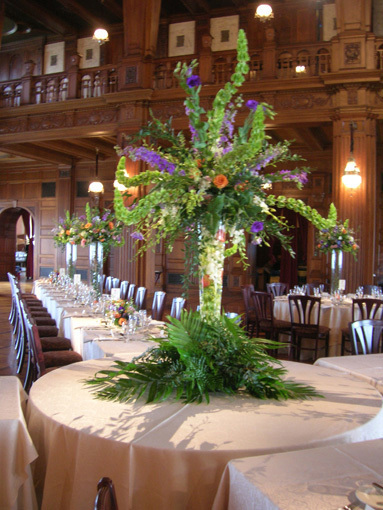 It is supported by 15 fluted oak columns 16-1/2 feet on center. The dancing area, set off by the pillars, is 66 feet square. Except for the floor, the woodwork, pillars, and paneling are Carpathian white oak, and the architecture is that of the Elizabethan era. The parquet floor is of quarter-sawed white oak in block parquetry design, divided in panels of 33 inches square with three-inch black walnut strips running in each direction. The floor is a floating wood floor set on thick deadening felt paper, which gives the floor a resiliency to pressure. The ceiling is of hand-painted acoustical tile so it blends in with the woodwork. The lounges at the south end on either side of the ballroom and mezzanine, are alike in décor and furniture. 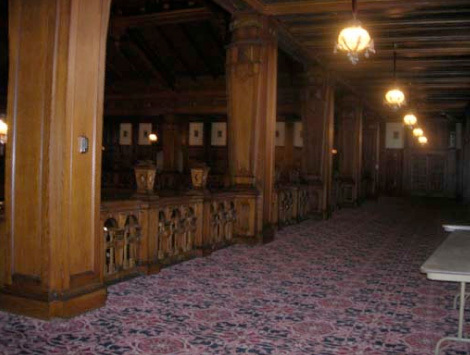 Between the lounges are anterooms where art glass windows symbolically depict degrees of the Scottish Rite and York Rite on the floor level and the Scottish Rite on the mezzanine level. The large chandelier above the ballroom floor is of gilded bronze with crystal beads and pendants. It weights about 2,500 pounds and contains nearly 200 light bulbs. It is suspended on a winch that permits it to be lowered for cleaning and replacing the bulbs. Complementary fixtures are hung on the pillars and under the mezzanine.